Add tomatoes and garlic, and red onions. Stir in balsamic vinegar; cook 3 minutes. Stir in salt. 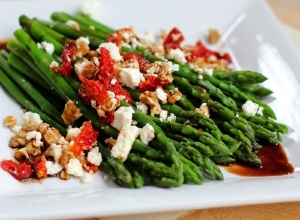 Sprinkle with black pepper, crumbled goats/feta cheese/tofu and dry toasted pine nuts.